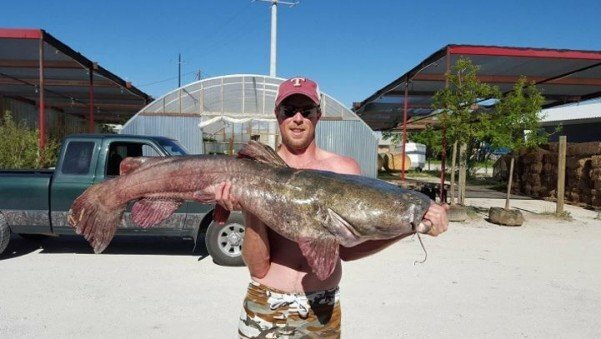 It took one Texas fisherman 45 minutes to reel in a record catfish and more than twice as long to fillet the sucker. Russell Hair was fishing with his 4-year-old son when he hooked the 41-pound flathead catfish on Lake Brownwood in central Texas. At first he thought it was a log, he told the local NBC affiliate. “I started reeling it in and when it got close to the boat it started going the opposite way and I was like ‘man this is definitely not a log,’” he told the station. Turns out the giant fish measured 46.25 inches long and 29 inches around, braking the state record that stood at 39.5 inches long and 31 pounds caught in 2010. Hair said he caught the fish on 18-pound test line with a crank bait. And while it took 45 minutes to get it to the boat, it took him all of two hours to fillet it out. Now that’s gonna be a lot of catfish dinners. previous articleHow Concerned Should You Be About Zika Virus?